(CNN) -- Two French advisers helping the Somali government with security were kidnapped in Mogadishu on Tuesday morning, according to the French Foreign Ministry. 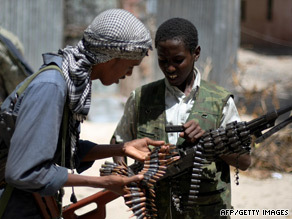 Young al-Shabaab militants with a heavy machine gun in Mogadishu on July 13. The two French citizens were on an official mission in the Somali capital when they were seized by armed men, the ministry said in a statement. Eyewitnesses said a group of gunmen stormed into Mogadishu's Sahafi hotel, which is frequented by foreigners, and seized the two French citizens. Somali government officials confirmed that about 10 gunmen forced their way into the hotel, but had no details on the reported kidnapping. Witnesses said the gunmen took the two blindfolded and bound hostages on foot towards Mogadishu's Bakara market, a stronghold for Islamist insurgents fighting against the Somali government. The Islamist insurgency in Somalia is led by Al-Shabaab -- an al Qaeda-linked group that is on the United States' terror list. Fighting in Somalia's capital city has displaced 200,000 Mogadishu residents since early May, according to the United Nations. Journalist Mohamed Amin Adow contributed to this report.